How big of a Neil Gaiman fan am I? Here’s a hint. I was first exposed to Neil Gaiman as a teenager by my sister, albeit a indirectly. She lent me the Bones of the Moon by Jonathan Carroll. I devoured it in a few days. I raved over it to her (it’s still one of my all time favorites). She mentioned that it reminded her of a particular arc of a comic book series called Sandman. I filed that away for future reference. About a year later, I was perusing my local Borders. I spotted a few Sandman trades. At that time I didn’t have a lot of money or many possessions to my name. Every purchase was carefully considered. I read each volume’s description until I found the one who’s plot sounded the most like Bones of the Moon. It was A Game of You. I took it home, hoping I hadn’t wasted my twelve dollars. It probably wasn’t the best place to jump into the series as it was the most self contained arc, without many links to the series overall. It didn’t matter, I was hooked. Over the next year I read the rest of the series in order of what was in stock at the book store at any given time. I had already realized that I liked comic books before I left home, but I doubt I would be as into them as I am if I hadn’t spent that time in the graphic novel section searching for Sandman volumes I hadn’t read yet. Once I’d devoured the entire Sandman saga, I snapped up everything else with the name Neil Gaiman on the spine. And they didn’t disappoint. Neverwhere, Mr. Punch, Stardust, they all sparked my imagination and made me see the world in a new way. I love the way he writes, often in a personal but slightly esoteric style. I love the way he mixes myths and everyday life in a way that makes me feel like this is the way the world has always been, I just hadn’t noticed before. And I love listening to him read his stories. And my love of his writing sent me down many unexpected paths. It led me to delving into comic books. It led me to going to signings and conventions at a time in my life when getting out of the house for things other than work was a challenge. It led me to other artists who spoke to me, like Jill Thompson, Dave McKean, and Susanna Clarke. What it didn’t do was spur me to do was write. Oh, it inspired me and made me long to be a writer. But I wanted to write like Neil, which I couldn’t. I would start a story and give up after a few paragraphs. I just couldn’t do what he does. It took a long time for me to realize that I’m not supposed to write like Neil, I’m supposed to write like me. Occasionally I hit on something that feels like it plays in the same sandbox as Neil’s work (such as the story I posted on Halloween) and it pleases me immensely, but I’m no longer trying to imitate my idol. After all, he does an excellent job of being Neil. We don’t need another one. And I get to create something that only I could have created. Maybe I’ll never reach his level of craftsmanship, but I’m going to keep trying. And that is one of many reasons I’m a fangirl. 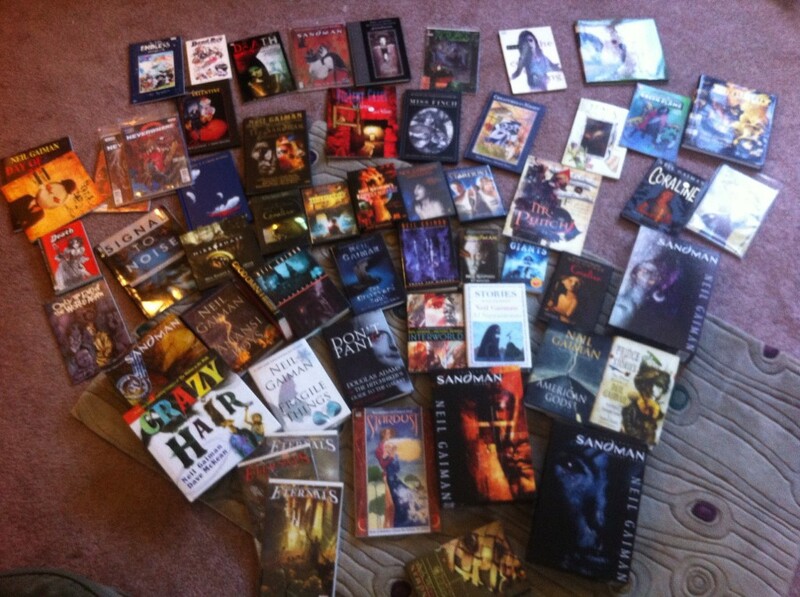 This entry was posted in Books, I'm a fangirl, me-me-me, People and tagged fangirl, fantasy, gushing, Neil Gaiman by Susie. Bookmark the permalink. Seems like an oversight that I didn’t recommend Sandman more directly back in the day. But I had read it issue by issue at the back of the comic shop then placed them back on the rack while friends with more enviable allowances purchased their comics at the front if the store.